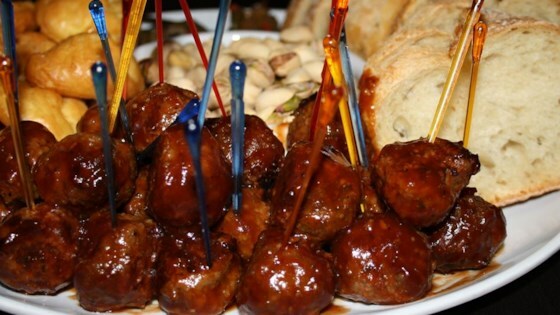 "This is a great appetizer meatball recipe with a little kick to it. It can be made ahead and frozen in resealable plastic bags, then added to sauce and heated." Preheat oven to 350 degrees F (175 degrees C). Lightly grease a medium baking sheet. In a large bowl, mix thoroughly the ground beef, hot pepper sauce, Cajun seasoning, Worcestershire sauce, parsley, onion, bread crumbs, milk, and egg. Form the mixture into golf ball sized meatballs and place on the prepared baking sheet. Bake in preheated oven for 30 to 40 minutes, or until there is no pink left in the middle. In a small bowl, combine the barbeque sauce and peach preserves. When meatballs are done, place in a serving dish and cover with the barbeque sauce mixture. Toss to coat. Looking for a simple appetizer for your next gathering? These are delicious! I used less milk and a little more bread crumbs. I also doubled the sauce to keep them warm in the crock pot. I brought these to a party ! A huge hit !! They have a good kick to them but not on "fire".